The patient is an elderly male with a past medical history of hypertension who presents to the emergency department (ED) with a chief complaint of lower back pain. He reports he was doing yard work earlier in the day just before the pain began and he thinks the pain may be related. It is associated with nausea, but not vomiting. The pain has steadily worsened, which led him to come in for further evaluation. He reported eating a ham sandwich of questionable quality earlier in the evening. He denies chest pain, shortness of breath, or radiation of the pain. He can identify no alleviating or aggravating factors. The patient has no surgical history and his family history is non-contributory. He does report a 30 pack-year smoking history. The vital signs are T 98.3 F, HR 79, BP 130/80, RR 17, and SpO2 100% on room air. Physical examination is notable for a well-appearing man in no acute distress with a non-tender and non-distended abdomen, no midline tenderness on palpation of the back, and no focal neurologic deficits in bilateral lower extremities. The rest of his exam is unremarkable. Given the patient’s age, risk factors, and atraumatic back pain on presentation, ultrasound (US) imaging of the abdominal aorta was performed. Transverse view of the abdominal aorta, below the renal arteries. What do you see on ultrasound? 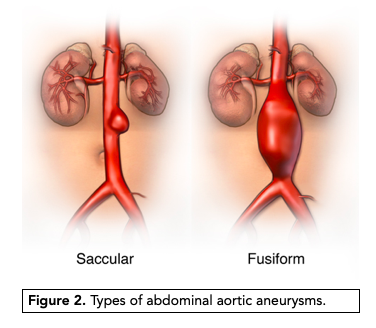 These images are consistent with an infra-renal abdominal aortic aneurysm (AAA), which is 7.47cm in diameter. The risk of AAA rupture is directly proportional to the diameter, with annual risk ranging between 1-10% for aneurysms that are less than 5cm in diameter (3). The annual risk of rupture with an aneurysm of this size is closer to 20%. Ultrasound for the assessment of the abdominal aorta begins with selecting the correct probe (curvilinear or phased array) and abdominal imaging preset. The patient should be in the supine position. The aorta should then be scanned in its entirety from the diaphragmatic hiatus to the aortic bifurcation, and distally into the common iliac arteries, in both the longitudinal and transverse planes. The aorta is easily identified as a thick walled, pulsatile, anechoic structure immediately anterior and screen right (anatomic left) of the spine shadow. 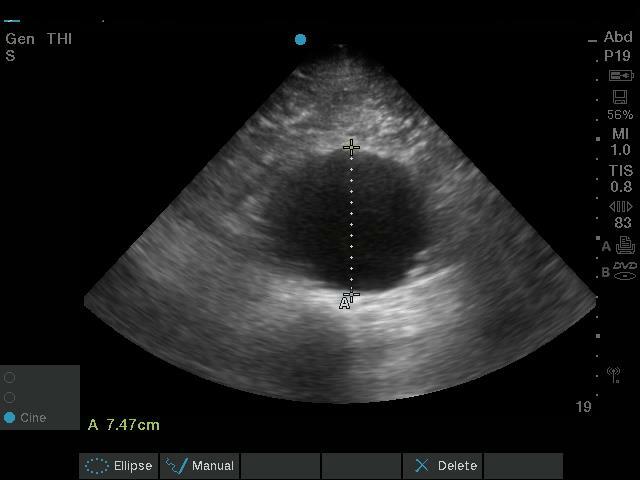 For an excellent tutorial on performing the aortic ultrasound examination please refer to Dr. Aalap Shah’s review here. Bowel gas is a commonly encountered obstacle to optimal visualization of the aorta. This may be overcome with the application of constant graded pressure to help displace bowel loops. Flexing the patient’s hips and knees can help by decreasing tension in the abdominal musculature. Placing the patient in the left or right lateral decubitus position may also help reposition bowel loops. Utilizing good sonographic windows and systematically fanning superiorly and inferiorly may increase the area of aorta able to be visualized. 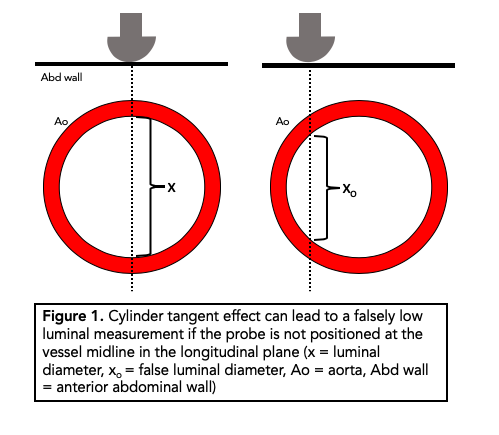 After scanning through the aorta, luminal measurements should be obtained in both anterior-posterior and left-right dimensions in the transverse plane. Measurements should be taken at the proximal (celiac axis), middle (superior mesenteric artery), and distal (bifurcation) regions. An AAA is defined as a 1.5-fold increase from the baseline diameter of the aortic lumen, however, baseline information is rarely available in the ED. For our purposes, any measurement of > 3 cm qualifies as aneurysm. For the common iliac arteries, a measurement of >1.5 cm is considered to be aneurysmal. Care should be taken to measure from outer wall to outer wall, as intraluminal thrombus or dissection flaps may lead to falsely low measurements. Longitudinal measurements can be taken; however, these may be inaccurate due to cylinder tangent effect, and thus are not routinely obtained (see Figure 1). Although we do not recommend obtaining measurements in the longitudinal plane, this view is important for better characterization of the aneurysm. Fusiform aneurysms are most common, with circumferential dilatation of the vessel as shown in Figure 216. This is in contrast to a saccular aneurysm, which is a discrete outpouching from a single portion of the aortic wall2. Along with expediting time to diagnosis, several studies have demonstrated that the use of ED ultrasonography to diagnose AAA approaches a sensitivity and specificity of 100% in the hands of an experienced emergency sonography 5,6 Interestingly, point-of-care ultrasonography performed by second year medical students with minimal training has been shown to be highly accurate in detecting AAA, out-performing physical examination by vascular surgeons8. Mortality from ruptured abdominal aortic aneurysm is high, but quick diagnosis can reduce risk of death. Hoffman et al. demonstrated in a 1982 study that a correct initial diagnosis of AAA was associated with a far lower rate of mortality (35%) than in those patients with an incorrect initial diagnosis (75%) 7. The sentinel study on ED ultrasound in diagnosing AAA was conducted by Plummer et al. in 199811. The authors demonstrated more timely diagnosis when the scan was performed in the ED, with a mean of 5.4 minutes for ED ultrasound versus 83 minutes for radiology ultrasound, and decreased mortality, with a survival rate of 72% with ED scans compared to 40% with radiology scans. More recently in 2014, Reed et al. demonstrated a non-significant trend towards a faster time to diagnosis in patients with ruptured AAA presenting to the ED undergoing ultrasound when compared with other imaging modalities12. As ultrasound is now a standardized component of emergency medicine residency curricula, one can hypothesize that this trend may become more significant with the increasing familiarity of this imaging study. Although ED sonography is both accurate and effective in the diagnosis of AAA, it is difficult to assess for evidence of rupture with ultrasound. A positive FAST exam is rarely seen in patients at time of hospital presentation, as patients with intraperitoneal rupture very rarely survive to hospital presentation. Evidence of retroperitoneal hemorrhage is less easily detected with sonography.A study of 60 patients presenting to the ED with clinical concern for rupture suggested that evaluation of para-aortic regions by US produced a sensitivity of only 4% for extra-luminal hemorrhage. However, a combination of sonographic confirmation of AAA, paired with clinical symptoms (abdominal, flank, or back pain) and hemodynamic led to appropriate operative management in 95% of cases13. Thus, in a symptomatic patient with an AAA seen on ultrasound, rupture or pending rupture must be presumed and appropriate action taken. It is important to note that both positive and negative predictive values of ED ultrasound in detecting AAA approach 100%, therefore there is a low risk of false-positive examinations going to the operating room based solely on sonography14,15. The patient was transferred to a tertiary care center and in the OR within 90 minutes of the initial bedside ultrasound. After noting the AAA on ultrasound, large bore IV access was established and pre-operative labs were sent. A call to radiology facilitated rapid CT angiogram that confirmed diagnosis of AAA with retroperitoneal rupture. The vascular surgery service at the referral center was immediately contacted and they planned to take the patient directly to the operating room on arrival. Blood products were prepared and sent with the patient as he was transferred via helicopter. On arrival, he underwent an emergent endovascular repair of ruptured AAA. He was discharged within 1 week in good condition, with plans to follow up with the vascular surgery team. Guideline developed in collaboration with the American College of Radiology, Society of Radiologists in Ultrasound. AIUM Practice Guideline for the Performance of Diagnostic and Screening Ultrasound Examinations of the Abdominal Aorta in Adults. J Ultrasound Med. 2015;34:1-6. Lema, P., Kim, J., & James, E. S. (2017). Overview of common errors and pitfalls to avoid in the acquisition and interpretation of ultrasound imaging of the abdominal aorta. Journal of Vascular Diagnostics and Interventions, Volume 5, 41-46. doi:10.2147/jvd.s124327. Brown PM, Zelt DT, Sobolev B. The risk of rupture in untreated aneurysms: the impact of size, gender, and expansion rate. J Vasc Surg. 2003;37:280-284. Blaivas, M., & Theodoro, D. (2004). Frequency of Incomplete Abdominal Aorta Visualization by Emergency Department Bedside Ultrasound. Academic Emergency Medicine, 11(1), 103-105. doi:10.1197/j.aem.2003.05.012. Handly, N. (2004). Prospective study of accuracy and outcome of emergency ultrasound for abdominal aortic aneurysm over two years. Annals of Emergency Medicine, 44(2), 189-190. doi:10.1016/j.annemergmed.2004.04.014. Kuhn, M., Bonnin, R. L., Davey, M. J., Rowland, J. L., & Langlois, S. L. (2000). Emergency Department Ultrasound Scanning for Abdominal Aortic Aneurysm: Accessible, Accurate, and Advantageous. Annals of Emergency Medicine, 36(3), 219-223. doi:10.1067/mem.2000.108616. Hoffman, M, et al. “Operation for Ruptured Abdominal Aortic Aneurysms: a Community-Wide Experience.” Current Neurology and Neuroscience Reports., U.S. National Library of Medicine, May 1982, www.ncbi.nlm.nih.gov/pubmed/7071748. Mai, T., Woo, M. Y., Boles, K., & Jetty, P. (2018). Point-of-Care Ultrasound Performed by a Medical Student Compared to Physical Examination by Vascular Surgeons in the Detection of Abdominal Aortic Aneurysms. Annals of Vascular Surgery, 52, 15-21. doi:10.1016/j.avsg.2018.03.015. Knaut, A. L., Kendall, J. L., Patten, R., & Ray, C. (2005). Ultrasonographic measurement of aortic diameter by emergency physicians approximates results obtained by computed tomography. The Journal of Emergency Medicine, 28(2), 119-126. doi:10.1016/j.jemermed.2004.07.013. Plummer D, Clinton J, Matthew B. 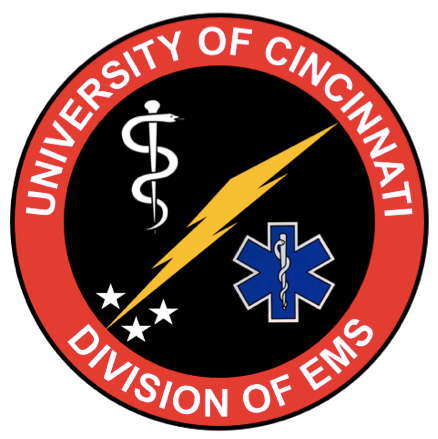 “Emergency department ultrasound improves time to diagnosis and survival in ruptured abdominal aortic aneurysm.” Academic Emergency medicine. 1998. 5:417. Reed, M. J., & Cheung, L. (2014). Emergency department led emergency ultrasound may improve the time to diagnosis in patients presenting with a ruptured abdominal aortic aneurysm. European Journal of Emergency Medicine, 21(4), 272-275. doi:10.1097/mej.0000000000000077. Shuman, W., Hastrup, W., Kohler, T., Nyberg, D., Wang, K., Vincent, L., & Mack, L. (1988). Suspected leaking abdominal aortic aneurysm: Use of sonography in the emergency room. Radiology, 168(1), 117-119. doi:[[https://doi.org/10.1148/radiology.168.1.3289085]]. Rubano, E., Mehta, N., Caputo, W., Paladino, L., & Sinert, R. (2013). Systematic Review: Emergency Department Bedside Ultrasonography for Diagnosing Suspected Abdominal Aortic Aneurysm. Academic Emergency Medicine, 20(2), 128-138. doi:10.1111/acem.12080. Lyon, M., Brannam, L., Ciamillo, L., & Blaivas, M. (2004). False positive abdominal aortic aneurysm on bedside emergency ultrasound. The Journal of Emergency Medicine, 26(2), 193-196. doi:10.1016/j.jemermed.2003.08.012.